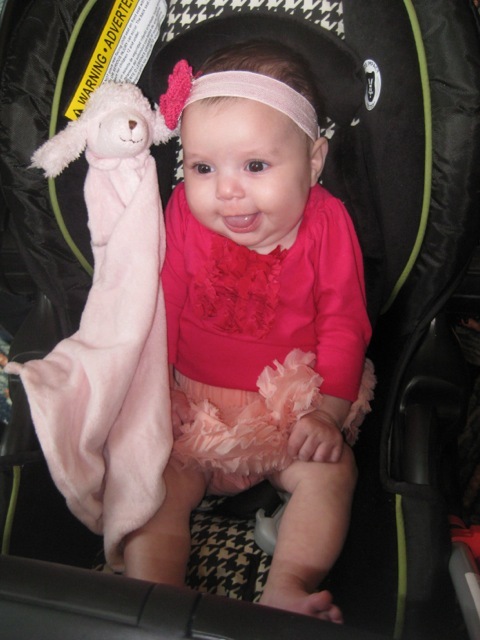 Born Friedman » Madelyn Gets The Giggles! Music to my ears! I finally got Madelyn to giggle and I wasn’t even trying! She’s been smiling for weeks and as much as I love her huge, gummy smile, they’ve been silent and I’ve been craving a belly laugh to complement them. This afternoon, I thought we’d take a little siesta together, but that was not part of Madelyn’s agenda. She was wide awake and did not succumb to her usual coma like she typically does after gulping a big bottle. So, what’s a mom to do with a baby and all of her energy? Play! I propped her up on my thighs as I stayed in bed and made silly sounds. She smiled over and over and finally let me know I was hilarious by offering a giggle. And another giggle. And more giggles! My heart inflated like a big, red balloon! It was probably the cutest thing I’ve ever seen and heard and I immediately tried to capture it on video, but the lighting in the room was too dark. So, I thought of the next best thing: audio! I’m so glad I thought to record her giggles because they are just too adorable; coos interspersed with gasps from deep down in her scrumptious belly! Seinfeld… Crystal… Martin… some of my favorite people that slap grins on my face, but there’s nothing funnier or more entertaining than a 3-month old giggling. I’m Madelyn’s biggest fan and there’s nothing I won’t do to elicit more giggles from deep down to her toes (you’ll notice I sound like a lunatic. Oh well, it works! )!